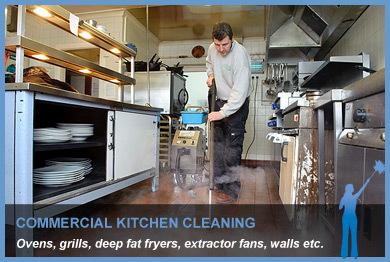 South West Specialist Cleaning Ltd, based in Beaminster, Dorset offer a complete deep steam cleaning service to restaurants and commercial kitchens. 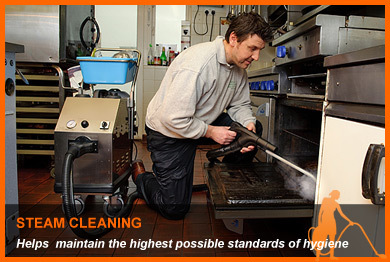 The service is designed to help you maintain the highest possible standards of hygiene. Ovens, grills, deep fat fryers, extractor fans, walls, tiles, grouting, floors, etc will be steam cleaned in your kitchen, at a time that suits your business, leaving your kitchen germ free, smelling fresh and most importantly within the health and safety guideline. Stevies Deep Steam Cleaning Services are available for businesses throughout West Dorset (Bridport, Beaminster, Lyme Regis, Dorchester, Weymouth, Portland), East Somerset (Crewkerne, Yeovil, Chard), East Devon(Seaton, Axminster, Honiton). As well as deep kitchen cleaning, we offer window cleaning, gutter cleaning, carpet and floor cleaning and full commercial and domestic cleaning services.